The day he rose from the dead Jesus found his disciples locked away from the world. Peter and John hadn’t stayed out long enough that morning to meet Jesus as he strolled about. The risk was too great that what had happened to Jesus would happen to them. Jesus himself had told them as much the night he got arrested. So there they met behind locked doors, not yet the church (though enjoying their first lock-in all the same). Then Jesus appeared and created the church out of a bunch of dry bones rattling in fear. He didn’t build a building or promise anyone full time jobs or even make plans for how to get more people into that room. Here’s how Jesus created the church: He said to them, “As the Father has sent me, I am sending you,” and then he breathed on them and said, “Receive the Holy Spirit” (John 20.21-22). The challenge is how to reconnect the church with her true identity, her missionary calling, her participating in the works of the Father and the Son in the power of the Spirit for the sake of the world God so loves. It’s more than a fresh coat of paint and another new name for the same old stuff (small/cell/home/life groups, anyone?). But it’s also not about throwing everything away under the illusion that we can reinvent the church out of nothing. The task is to recover the original purpose and power of the church that lie dormant in her liturgy, in her theology, and in the hearts and minds and bodies of her people. To that end, there’s going to be a gathering of people who want to see the church live and move and breathe again in our community. 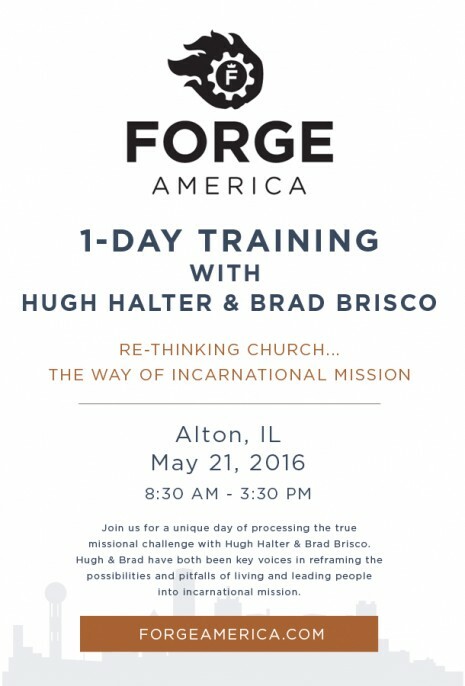 On Saturday, May 21, we’ll do an all day training on incarnational mission here in Alton, IL, led by two very gifted and experienced leaders, Hugh Halter and Brad Brisco. If you’d like to join us, that would be amazing. You can register here: http://forge1day-alton.eventbrite.com.